Into a large microwavable bowl, measure popcorn, cereal and peanuts. Line cookie sheet with waxed paper or foil. In 2-cup microwavable measuring cup, microwave brown sugar, butter and corn syrup uncovered on High 1 to 2 minutes, stirring after 1 minute, until melted and smooth. Stir in baking soda until dissolved. Pour over popcorn mixture, stirring gently until evenly coated. Microwave on High 3 minutes, stirring every minute. Spread on lined cookie sheet. Cool 10 minutes. In a small microwavable bowl, microwave green candy melts uncovered at HALF POWER power for 2 minutes, stirring after 1 minute, until melted and smooth. Drizzle over popcorn mixture on cookie sheet. Repeat for pink and yellow candy melts. Immediately after drizzling the last color, sprinkle with colorful jimmies and sprinkles. Sprinkle with salt if desired. Refrigerated until candy is hardened and set. Break into bite-sized pieces and serve in bowl or glasses. TO MAKE FLOWERS (OPTIONAL): Use a tiny flower-shaped cookie cutter or knife to cut flower shapes from Fruit Roll-Ups™. Use a clean scissors to cut leave shapes from Fruit by the Foot™. Place flower pieces and leaves back-to-back with a pretzel stick (or cake-pop stick) between them; press to seal. Add faces with black gel frosting if desired. 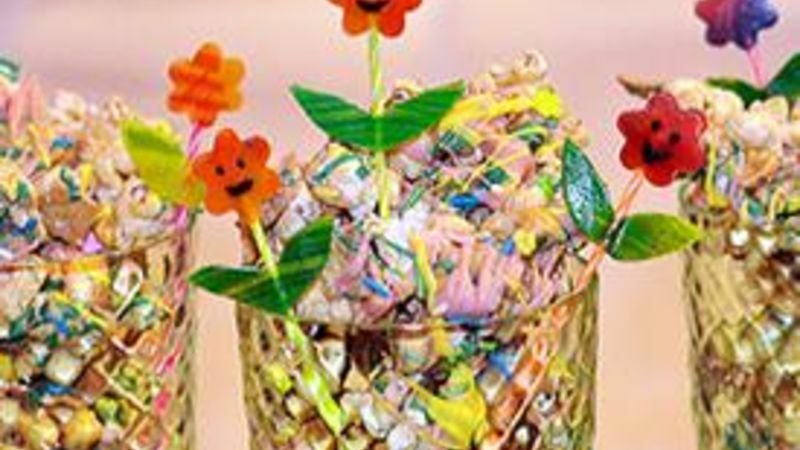 Use flowers as garnish in cups of popcorn snack as pictured. Throw your arms around Spring's neck and give it a big squeeeeze with this simple Flower Power Popcorn Snack recipe that makes you wanna draw a smiley face somewhere. Spring is just so ... UP. It's the life of the party as far as seasons go. And it makes you want to make cute, fun, colorful snackypoos. And make up words -- like snackypoo. Ever see popcorn smile? Hehe...now you have! How could this snack possibly be a Debbie Downer? Just look at it! First mix popcorn with sweet Frosted Toast Crunch cereal and salted peanuts. Sweet and salty. Righteously ridiculous already. Then make a simple caramel syrup in the microwave. Toss the popcorn-cereal-nut mixture with the syrup and lay it out on a lined pan. Let all that cool until it can be handled without melting all over your hands (tempting as that sounds...). Then break it up and put it in little paper cups or bowls. Flower power incoming! These li'l flower garnishes make your snacks so haaaaaappy. Just skip the flowdies if you're in a hurry to inhale your snack. They're not essential -- they're just super cute! Make this snack and you'll be spotting smiley faces everywhere too -- even on you!